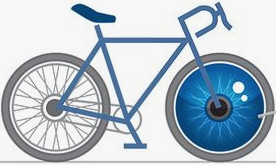 What do your eye and a bicycle tire have in common? They both require the right amount of internal pressure to function safely and effectively. 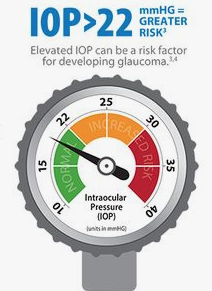 People with Glaucoma often have pressures inside the eye that are too high. Increased eye pressure leads to irreversible damage to the optic nerve and ultimately, permanent vision loss. Checking the pressure inside the eye is one of the most important tools our doctors use to screen for and monitor Glaucoma. Our eyes are filled with a clear fluid called aqueous humor. The aqueous humor is produced by a structure in the eye behind the iris and this fluid is in a constant flow of production and drainage in order to keep the eye pressure at a steady, normal level. When the pressure inside the eye becomes too high, there is too much force being exerted on the optic nerve and it can become damaged, causing Glaucoma. There are several factors that can lead to or cause high pressures. The pressure can increase inside the eye if too much aqueous is being made or if the amount of aqueous being made is drained too slowly from the eye. Certain medications, injury or trauma to the eye and other eye conditions/diseases can contribute to higher eye pressues as well. Our doctors, all of whom are board-certified to manage and treat Glaucoma, check eye pressures during every single eye exam you receive at Grin Eye Care. Checking the pressure inside the eye is the easiest and most important screening tool we have for Glaucoma. The eye pressure test, called tonometry, is painless and only takes a few seconds. A numbing eye drop, containing a special dye that glows under a blue light, and a special instrument are used to measure the pressure. The normal range for pressure is usually between 10 and 22 and is measured in the units of millimeters of mercurcy (mmHg). The only way to know if your pressure may be high is to have it checked by an eye doctor. Remember that Glaucoma has no symptoms until the late stages, when up to 40% of vision is irreversibly and permanently lost. Don't let Glaucoma steal your sight! Call us to schedule an appointment at any of our three locations (Olathe, Leawood & Grandview) for your annual comprehensive eye exam. We are open Monday through Saturday, with evening hours on Monday and Tuesday. We are happy to answer any questions you may have and are committed to ensuring you receive the best, most up to date comprehensive care to keep your eyes healthy for years to come. Call us today!